30 « October « 2006 « She just can't sit still! I love this spinning wheel. It’s made in Canada. No, order it’s finely crafted in Canada. It folds for travel, it has a modest footprint and it flies so smoothly and quietly. I’ve spun everything from laceweight to chunky yarn with great success. 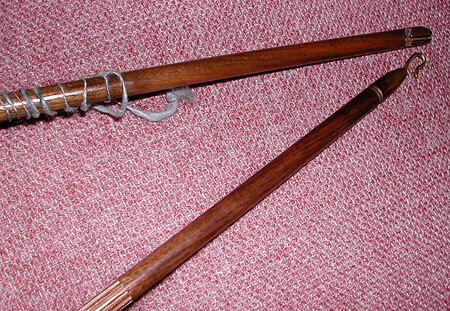 It uses Scotch Tension which is a really fine adjustment with a knob, cotton cord and a rubber band. I can tighten and losen it with small movements for precision. This controls the take-up speed of the fiber onto the spindle. It’s a double treadle (two pedals, two feet) which I am so grateful I could get instead of the single treadle. Spending a lot of time spinning and only using one foot is not optimal. With two pedals I can stop and start the wheel using my feet on the pedals. The fatigue factor is tremendously reduced and worth the extra money. 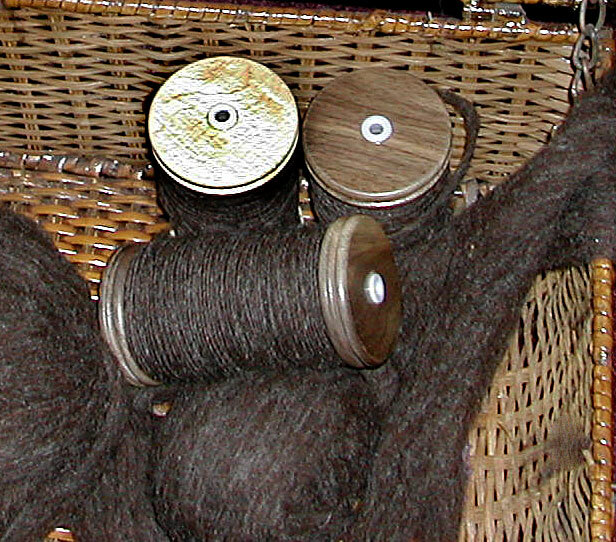 Here you can see the new bobbins I just got which I ordered in walnut, even though everything else is in maple. This was pretty much everything that came with the wheel (it did include 4 maple bobbins). The bobbins are on a lazy kate, with a scotch tension cord along the bottom of the bobbins. The piece to the right is the bracket for the regular flyer heads. On the pedals are the two flyer heads. The normal one on the right, the fast flyer on the left (you can see the smaller circles, which is where the band goes to set the ratio.) 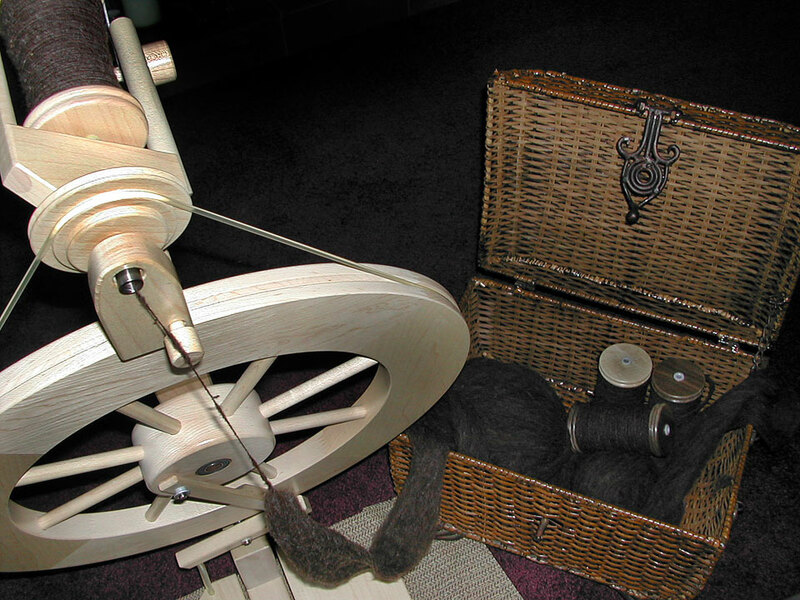 At the top of the wheel, the larger plying bobbin and bracket are attached. 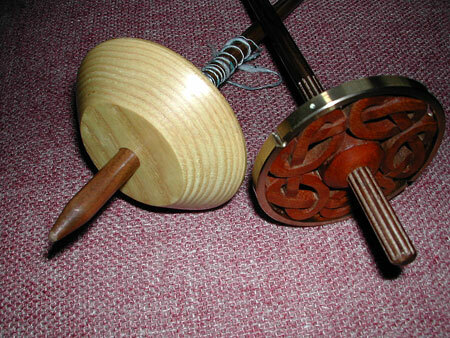 There are two bands, on the wheel, one is for the plying head, the other for the regular flyers. The bracket can also be raised and lowered to adjust tension to keep the bands flowing free. I have the wheel on a piece of rubber fabric that you put under rugs to keep them from slipping. The wheel is light, so without it the wheel tends to walk a bit. I sit in a really nice padded chair we bought when we got our sewing table. The padded back is a godsend. I have some thoughts on drop spindles as well. I have two and I still love using them. I learned on a bottom whorl and I believe that it taught me a lot in preparation to moving to a wheel. There’s something wonderfully visceral about using the drop spindle. I tend to overspin a bit on the wheel still, but the yarn I spin on the spindles now is perfectly balanced when I wind them off on the swift into a skein. I can’t wait to get to that stage with the wheel. It’s also still a lot easier to travel with a drop spindle than with the wheel. The first spindle, on the left, I got from Heritage Spinning in Oxford. The owner, Joan, has her father make these. The channel up at the top is excellent for keeping the yarn balanced and held. It’s a very simple spindle, reasonably priced, elegantly made, and it served me really well in the beginning. The second spindle Brian got for me this past Christmas. It’s a ring spindle from Golding that can be either a top or bottom whorl. I’ve tried spinning from a top and I don’t like it as well as a bottom, which is slower. This has some incredible features, like the notches in the ring to keep the fiber from slipping and the hook at the top works like a champ. It’s beautifully weighted, but because of this, it requires understanding what a fiber needs for spinning. For example, it’s too heavy for cotton. The spindle on the left, my first one, has a little bit of recycled cotton denim I tried spinning. The spindle is still a little heavy and that makes for a very uneven thread. Cotton can easily take 1000 twists per inch and the drop spindle just can’t quite go fast enough. I am enjoying everything about spinning. It’s easier and often times cheaper to go and buy yarn, but I really love knowing how much a part of the process I’ve been. Lace scarf: added 12 inches, capsule 1/3 complete. Gloves for Britts: 2 of the 6 patterns sewn on. I spent a bunch of lovely hours this weekend spinning up the soft, what is ed springy Babydoll Southdown fleece that I’ve slated for a Henley style sweater for Brian. Hopefully, misbirth I’ll have the rest finished up this week and than a trip perhaps next Wednesday to visit Joan at Heritage Spinning so that she can help me replicate one of Brian’s favorite sweaters. Here are a few pictures of me spinning this project on my Lendrum wheel. This is such a wonderfully hand made wheel that is so versatile and pretty to boot. I recently bought 4 new spindles, which I got in walnut. Just like my fondness for mixing metals, I love to mix woods, too. Having 8 spindles means that I can do multiple projects at one. I have 4 in use for this project, and one each for 3 other projects. I have one free for anything. This way I can spin what I want and not be limited to finishing one before starting another. I’ve always felt bound to finish one thing at a time, but I get bored with some projects so this allows me more creative freedom. My goal this week is to finish the yarn for Brian’s sweater and to finish sewing the patterns on Britt’s gloves. I will have a new project shortly as one of Brian’s coworkers wants a pair of short gloves that I’m eager to get to work on.